SCHEELS’ corporate headquarters is located adjacent to the store on the 14-acre site. The 60,000 square-foot facility includes SCHEELS marketing, corporate buying offices, information services, and a fixture manufacturing facility. An employee fitness center and an 11,000 square foot employee childcare center, which accommodates up to 65 children, are also included in the complex. On July 1, 2006, SCHEELS opened its 196,000 square foot shopping experience on 45th Street in Fargo, just north of Interstate 94. This state of the art store showcases North Dakota’s largest selection of sports, sportswear, and footwear under one roof. Unlike a typical sporting goods store or department store, Fargo SCHEELS is a collection of entertainment venues, as well as women’s, men’s, youth, specialty, and sport and game shops. Brand-name concept shops by Nike, adidas, Columbia, Under Armour and The North Face feature the best sport apparel products. Each shop is staffed with experts who are focused on their passions. The SCHEELS in Fargo features boutiques ranging from technical running gear and the latest fashion sportswear to spectacular hunting and fishing shops. The athletic shoe, hiking boot, and casual footwear selection are largest in the Midwest with everything for toddlers to serious climbers, with selections ranging from beach sandals to fashion boots for women. Outdoor enthusiasts will experience world-class shops including golf, bike, ski, paddle, and sport and game shops. The gun and hunting shops have the largest retail selection of guns in the state of North Dakota, ranging from everyday shooters to collectible guns. Yes, this store has a full-size ferris wheel! 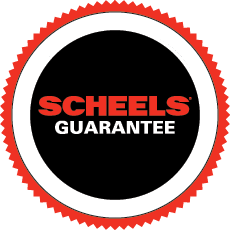 The focal point of Fargo SCHEELS is the “SCHEELS Wheel”. This 45-foot, 12-car, 1953 park-style Ferris wheel was completely refurbished for SCHEELS by Eli Bridge Company. It features a colorful light display and an all-new cable drive system that runs with the touch of a joystick. Ginna’s Cafe Sandwich and Fudge Shop, named after the Grandmother of Scheels’ CEO Steve M. Scheel, serves gourmet soups and sandwiches, Starbucks® coffee, Bavarian roasted almonds, and over 24 flavors of homemade fudge. Gather in the Archery Shop and utilize our “try before you buy” archery range, where expert associates are ready to fit you for a new bow or fine-tune one you already own. Honor our forefathers with a tour of the “Scheels Walk of Presidents.” Each life-sized president is constructed and costumed to represent them the way that Scheels imagines and history remembers them. A beautiful, custom-built Home Décor and Gift Lodge that features a unique collection of beautiful gifts, home décor, and artwork. Special attractions include two masonry murals on the outside of the building, one that portrays the hunting and fishing passions of the North Dakotan outdoor enthusiast, and the other a memorial in honor of Roger Maris. Test your aim in our shooting gallery! Test your swing in our golf simulator!